The NTS-6002-GPS is an update to our best selling NTS-6001-GPS. At the request of our customers the unit was slimmed down to a space saving 1U rackmount unit and the front display updated. 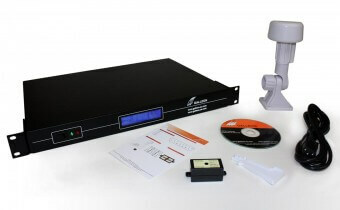 As with it's predecesor the Galleon NTS-6002-GPS Network Time Server combines a GPS receiver with an embedded solid state computer running the Linux operating system. The unit connects directly to your network via a CAT5 Ethernet connection and fits in a standard 19" rack. This GPS NTP server incorporates a GPS computer clock and a highly accurate remote antenna that tracks up to 12 satellites for increased precision. The antenna is fully weather proof (IP65) as it must be installed externally, preferably on a roof top with a 360° view of the sky, it can be positioned up to 200m (600 ft) away as standard, or up to 1,000m (3,000ft) using an optional antenna extension kit. The NTS-6002-GPS has dual Ethernet ports enabling it to serve time to 2 independant networks and can handle more than 5,000 NTP requests per second per network, making it the first choice for providing accurate time information to large networks with thousands of clients! Includes GPS active antenna + can support a secondary time receiver for the MSF/WWVB/DCF radio time signal. Solid State Flash memory enables software upgrades and eliminates 'disk failure'.